Home » Our insights » Blog » What does an ideal quote process look like? What does an ideal quote process look like? 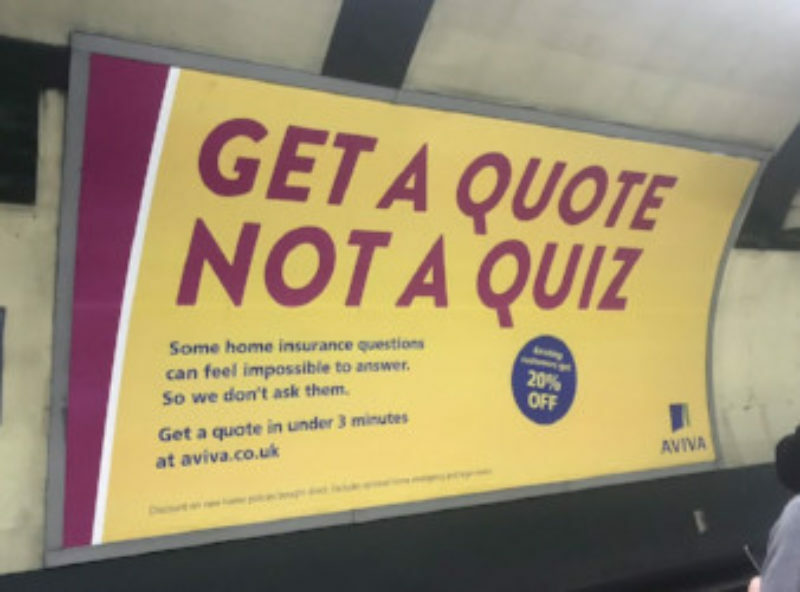 Aviva's new quote process is good, but could it be even shorter? And what would the perfect journey look like? While compiling our latest Customer Experience Ratings, I’ve gone through a fair few product journeys. While this may not sound too thrilling, Aviva have recently based an entire marketing campaign on this. They boast a much shortened home insurance quote process. The aim is to make it easier for consumers to get a quote, and reduce the fear of providing wrong answers. Aviva feel this is important enough to warrant both TV and billboard advertising. They’re not wrong. According to research conducted by Censuswide in 2017, 76% of UK adults with home insurance feel the quote process needs to be made simpler and quicker. And 32% of UK adults with home insurance have given up on an application because it took too long, or they didn’t have the right information. The question of what should and shouldn’t be asked in the quote process was posed at our Misbuying Insurance event. The panel discussed a number of ideas, each broadly agreeing that the questions asked are by no means set in stone. So I turned my attention to Aviva’s new journey to compare it with the more orthodox journeys - and to figure out what an ideal quote process might look like. Aviva’s journey is definitely not just marketing hype. It is considerably quicker than any other quote process I’ve been through - and I’ve been through a lot. In fact, there are few enough questions for me to quickly list them here. It begins with personal details. The consumer’s name, title, date of birth, address, email address, and phone number are asked for. It then asks for the type of cover required, the policy start date, if a joint policyholder should be added, and the consumer’s claims history. Finally, it shows a list of assumptions to be agreed with. These include what material the walls are made from, whether the building has ever been flooded, and whether the building is listed. Using just this information, Aviva can provide a quote. It’s great to see a large company innovate so freely on a major product. And it calls into question why it’s so normal for some providers to ask three times the number of questions to do the same thing. Is this the future? Well, in my opinion, not quite. This just scratches the surface of how quote processes could be shaken up. The question of what an ideal quote process looks like can be split into two parts – when questions are asked, and what those questions are. The number of questions asked should be the minimum required to offer a quote. Asking for the consumer’s title before offering a quote is redundant. So too are gender, marital status, contact details, and marketing preferences. These can be asked after the quote is given, before the consumer confirms whether they’ll be buying the policy or not. That way, the consumer can get to the quote more quickly and easily - providing better incentive to go through various providers’ processes to find the best one for them. There is also the question of what should be asked at all. There are a number of questions that the insurer could answer better than the consumer by simply using the address given. From the address, the insurer should have access to information on whether the house is near a quarry, free from flooding, and so on. The same is true for individuals’ details. A name and address is enough to bring up the consumer’s claims history, criminal convictions, and whether they’ve been declared bankrupt. So why ask this at all? Asking the consumer for information insurers can find themselves can only result in two things. Either the consumer answers correctly, which confirms what the insurer can already find out. Or the consumer answers incorrectly, which could invalidate their claim later on. At its worst, this is setting a trap for the consumer to fall into. The consequences of non-disclosure can be severe. But if the insurer could gather that information themselves, then why force the customer to give it and potentially make an error? There are also a number of questions which the consumer can’t work out themselves. Who realistically knows the rebuild cost of their house? The ABI suggests asking a qualified surveyor – but who has the time, or money, to do this? And if a qualified professional is required for an accurate answer, then why do so many insurers ask the consumer for their judgement? Insurers are in the business of rebuilding houses – or at least paying for rebuilds. They should be able to answer this question without putting the onus on the customer. The same applies to the total cost of the contents. This is one that the insurer can’t answer, but often neither can the consumer. Research from Direct Line shows that in the five years leading up to 2017, more than half of claimants had underinsured their contents. The industry needs to offer better tools to help consumers avoid underinsurance. Particularly because the consequences can be so harsh. Some providers and comparison sites do offer calculators, but they are often unhelpful. For example, Confused provides a contents value calculator. But rather than ask the consumer to input their possessions, and work out the value from there, it asks consumers to estimate the cost of their contents per room. All this is doing is breaking down the complex task by room – and then doing some addition. It’s not helping the customer with the difficult task of actually carrying out the valuation. We’ve looked at what questions should be asked, which ones the insurer would know better answers to, and ones that require more assistance. But what about the questions that are ultimately useless? Having been through a number of quote processes, there are definitely a number of questions that don’t need to be asked. Why is someone buying home insurance asked when their car insurance is due for renewal? Or how they heard about the company, or how long they’ve been at their previous insurer? [Ed: we know the answer to this, but think these questions add unnecessary clutter to the journey]. Then there’s the more niche ones. Is your home a working farm? Do you own a caravan? Have you liked us on Facebook? These are just some of the strange questions posed before a quote is given. So what does ideal look like? The ideal quote process would ask only what the insurer cannot possibly know, and only that which is required to provide a quote. There’s scope for true innovation here. Take the new, online insurance advisor Brolly. The consumer is asked ‘would you bet on a sure win of £500, or a 1-in-5 chance of £10,000?’ to get an idea of how risky they are. While I’m not saying this sort of question is mandatory, it’s certainly a novel approach. And if you think that Aviva is the only large insurer taking a fresh approach to the quote process, then check out Legal & General’s home insurance journey – it’s half the length of Aviva’s. Think hard about what questions are actually needed in your quote process. Are there questions being asked simply because they always have been? You’ve got to innovate to stay ahead of the curve. Streamlining your process, improving conversion, and reducing the likelihood of invalid claims seems a great place to start.